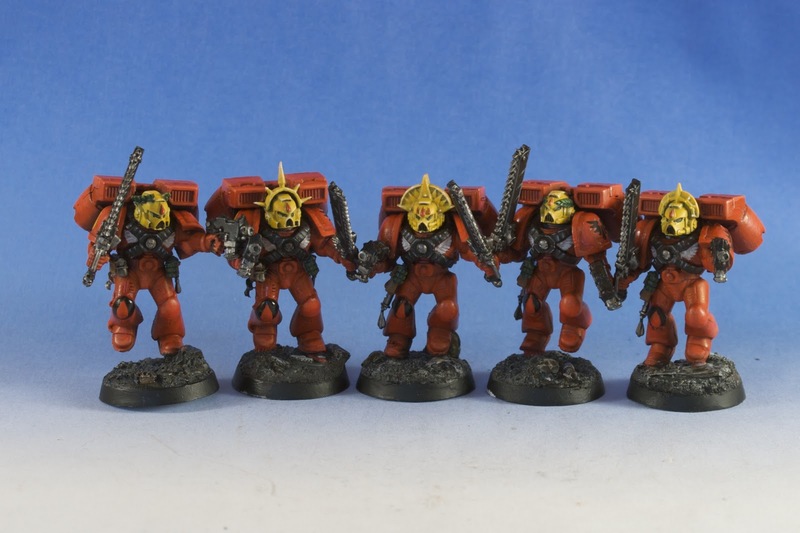 Finally, I have images of the completed Blood Angel Assault Marines (these are for you Ron!). The final details were completed, the bases done, and the models are in the hands of their owner (who is, by the way, very happy with the models!). In fact, he is trying to get me to do more Blood Angels for him (despite my slowness!). Anyway, I like these models a lot. In fact, if one were to *have* to paint more models for a Blood Angels army, I'd choose these. :) Sadly, there are only 5 of the dudes to paint. As of this writing, I am actually done with the Blood Angels and have sifted my attention fully to preparing for Adepticon. Over the next couple of weeks, I'll be posting images of the completed Blood Angels as well as sprinkle in some of the Adepticon hobby goodness that is on my plate.